Actor Steve McQueen's 1963 Ferrari has sold for $2.3m (£1.2m) to an anonymous bidder in California, nearly doubling its estimated price. The metallic-brown Ferrari 250 GT Berlinetta Lusso was expected to fetch $800,000 to $1.2m (£600,700). 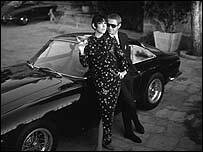 McQueen bought the car, with beige leather interior, in 1963 and used it as his everyday runaround for 10 years. "I couldn't be happier for the car and the legacy of Steve McQueen," said the car's seller, Mike Regalia. McQueen traded the Ferrari in 1973 but left his stamp on the "McQueen Ferrari Lusso", which was acquired in 1997 by Mr Regalia, a car restorer. When asked how much he had paid for it, Mr Regalia said: "A new Lexus would cost more than what I paid". The car was sold at a Christie's auction at the Monterey Jet Center. McQueen, nicknamed the "king of cool" for his portrayals of nonchalant, in-control heroes, was a car collector and racing enthusiast. Mr Regalia restored the car to its original condition, which took more than 4,000 hours of work. McQueen reportedly performed some of his own driving stunts in films. 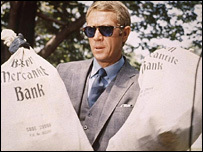 One of his most famous car chase scenes was in the 1968 film Bullitt. He is probably best-remembered for his role in The Great Escape, in which his character breaks out of a World War II prison camp and attempts to escape on a motorcycle. Contrary to popular belief, he did not perform the stunt himself. That honour went to his friend and stunt double Bud Ekins, who also drove in Bullitt. Following The Great Escape, McQueen earned a best actor Oscar nomination for his role in the 1966 war drama The Sand Pebbles. He died in 1980 following surgery for lung cancer, aged 50.